3 different varieties to tickle your taste buds. A superb chilli pepper collection - 3 different colours and heats. Supplied as 9cm potted plants, the hard work germinating has been done for you. Grow on in a warm, sunny spot - outdoors, or windowsill, conservatory or porch. Compact varieties that will stay below 60cm or so, ideal for patios and smaller spaces. 1 plant each of 3 different Chilli varieties: Hot Banana, Big Sun and Thai Dragon. A superb chilli collection whether you're an avid pepper fan or the newcomer to growing them - 3 different varieties and heats to suit all tastes. Supplied as 9cm potted plants, so the hard work germinating has been done for you, these are compact chillies, so great for pots and will also sit happily outside in the warmer months on a patio or decking. The plants vary in heat and character so there's something for every palate, from the cautious to those with more adventurous tastes. Hot Banana - Medium-hot peppers. 6-inch long, green-yellow fruit. Big Sun - Very-hot peppers. 3-inch long, bright yellow fruit. Thai Dragon - Hot peppers. 3-in long, green to bright red fruit. Chillies are self-pollinating so a gentle shake of flowers will help get the pollen moving. Once your chillies start to flower, start to feed with a tomato feed at the rate suggested by manufacturers to encourage fruit to set. Pick regularly to encourage more fruit. Fruit left on the plant to ripen fully have the strongest flavour and heat but will inhibit further fruit production. Chilli plants do well is warm, sunny places so a greenhouse or conservatory is the ideal place for them. 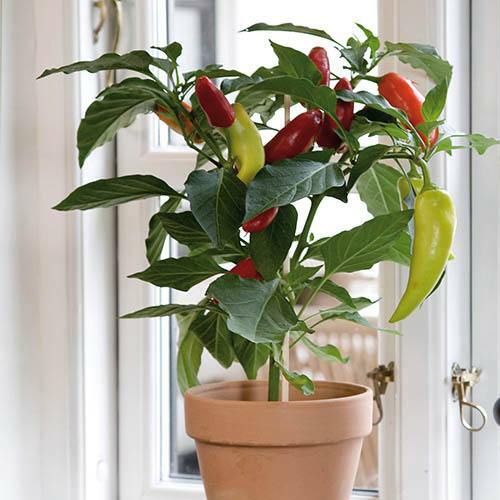 One of the most important aspects of growing chillies is to water regularly, twice a day if the weather is hot. Once flowering starts, feed with a high potash fertiliser.